If you are comparing prices on balloon kits please compare ours against premium quality balloon kits offered elsewhere rather than against economy versions. Economy kits contain cheaper balloons meaning less float time and more breakages. Our kits include hire of balloon gas cylinder and regulator, premium quality 28cm latex balloons in your choice of colour/s, matching pre-cut ribbons, balloon clips, instructions, sizing template and a couple of spare balloons. Want printed balloons instead of plain? In a standard priced kit add .45c per balloon, in a pearl or metallic priced kit add .40c per balloon for each printed balloon replacing a non printed balloon. In a standard priced kit add .25c each, in a pearl or metallic priced kit add .20c each for a chrome balloon replacing a standard, pearl or metallic balloon. The balloons supplied in our DIY kits are the same quality balloons we use in store. 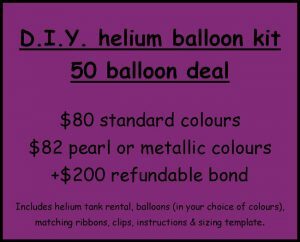 Helium is not cheap so using inferior balloons in so called ‘economy kits’ can be such a waste if you get more breakages and less float time. 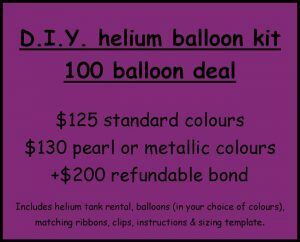 A deposit of $200.00 is required on all balloon kits and or tanks, refundable on return of helium tank and regulator. Please return cylinders & regulators on or before the due date shown on your receipt for a full refund of your deposit. We provide a sizing template with our helium tanks to ensure you get the quantity of balloons you expect. The templates provided are for standard sized latex/rubber balloons. If you are blowing up larger balloons you will obviously use a lot more helium. Prices quoted are for daily, overnight or weekend hire only. Please email us about extended hire rates if you need a helium tank long term. Sorry we do not stock disposable helium tanks as we have compared the volume of helium in disposable tanks and found that they are very poor value in comparison to hired cylinders. If you are thinking about buying a disposable helium tank make sure you read the fine print on the packaging, check out the volume of helium and the quantity and size of the balloons they fill. Standard $1.80 each, Pearl or Metallic $1.90 each, Chrome $2.10 each, Printed $2.40 each. Loose balloons are on curling ribbons of your choice. Not all balloons are the same, our helium filled rubber or latex balloons float for 12-18 hours not 5-6 like many discount store balloons. Need your balloons to last longer? For .60c extra each we can treat them with Ultra Hi-float and they will last from 2 – 5 days depending on air temperature and movement.